The lowest price of home by Nilkamal PEAK Solid Wood Dining Set ( Finish Color - Cappuccino ) is at Flipkart where is it is for INR 13700. This price is INR 26200 lower than the other price for the product. The prices for the product change across variants. 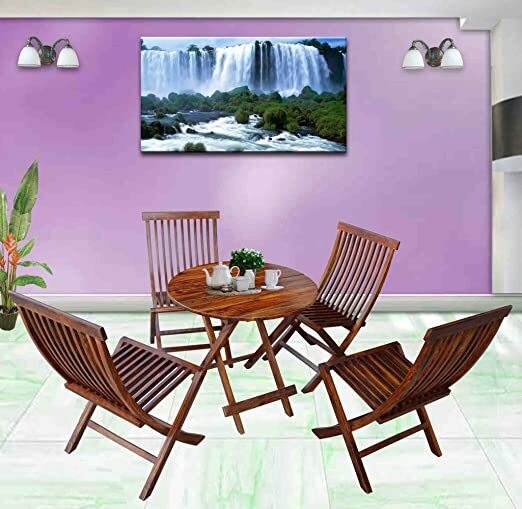 The price for home by Nilkamal PEAK Solid Wood Dining Set ( Finish Color - Cappuccino ) is valid across Bangalore, Hyderabad, Chennai, Mumbai, Delhi, Pune and Kolkata. The home by Nilkamal PEAK Solid Wood Dining Set ( Finish Color - Cappuccino ) is available at best price of INR 13700 on Flipkart. Not Covered in Warranty Warranty does not cover any external accessories such as damage caused to the product due to improper installation by customer. Value for money Brilliant service by fipkart n nilkamal. Delivered 1 week ahead of promised date. Product packaging was great and it took about 30min for installation. Nilkamal people for installation were professional. Product delivered is exactly as present on fipkart, finishing/look n feel is good. However, i doubt the strength of the wood, ofcourse what can we expect at this price. This is very good product to use for few years. Installation is not yet completed as one chair was broken and waiting for new chair as replacement since 10 days. Product is excellent! Awesome look and finishing! However installation and flipcart service is very very poor.